The number one factor that affects your body composition and athletic performance is training. The number one factor that affects training is your nutrition, and part of any complete nutrition plan is appropriate supplementation. It should come as no surprise that protein is the most important single nutrient to consider, but did you know that proteins quintessential importance is due almost entirely to its essential amino acid (EAA) content? EAAs are pound-for-pound more effective for increasing and maintaining muscle mass than protein! They’re also effective for increasing muscle protein synthesis without adding calories to help attain a lean and muscular physique. 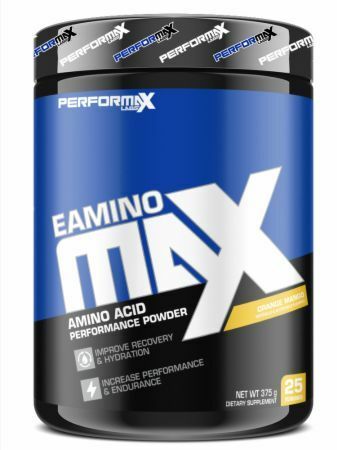 EAminoMax contains all 9 of the essential amino acids, including 3 grams of leucine. EAminoMax is much more than just an EAA supplement with 2 open-label blends to optimize performance and hydration. L-Leucine – The most important amino acid triggers muscle protein synthesis at an optimal dose of 3 grams. Essential Amino Acids – At a dose of 7 grams, the EAAs in EAminoMax are as effective as a full serving of whey protein for enhancing body composition and recovery. L-Carnitine L-Tartrate – Carnitine improves endothelial function, increasing blood flow, nutrient delivery, and clearance of metabolic waste to keep muscles powerful and running clean. HICA – This leucine metabolite is a powerful anti-catabolic agent, capable of reducing soreness and increasing lean mass. Hydration Blend – Coconut water plus additional electrolytes in sodium and potassium chloride keep the active body hydrated to ensure proper metabolic function and reduce cramping. Essential amino acids are called essential because they help you recover from training the right way. After a few days, nobody remains sore and unrecovered, but it’s the EAAs that make sure the repair process results in more than just a subsiding of muscle soreness. EAminoMax provides the EAAs necessary to come back stronger and stronger after each and every training session; the carnitine to improve blood flow and the amount of EAAs that make it to the muscle; HICA to reduce the breakdown of newly attained lean mass; and electrolytes to replace those lost during grueling workouts. If you intend to keep training hard, correct supplementation is key, and EAminoMax is an essential part of a supplement regime!